Where can I get the flags? Dowco has free flags available for pick up at our office! We’ll also provide you with a complimentary bag of seed. And we’d love to meet you. Home improvement stores also sell flags. What else could be used instead of flags? Unfortunately, paint is not easily visible to the crews when standing behind large equipment. We've seen some creative clients use plastic cutlery or wire hangers. Anything that sticks out of the ground and is easily visible should work. When do I flag the system? Have your system flagged prior to the morning of the first day listed on the calendar. What will Dowco do with the flags upon completion? Dowco will pick up the flags upon completion and leave them in mulch beds so that they do not rust on the driveway. Bundle and save them for next year! Can Dowco flag for me? Yes. Dowco can flag the system for you at a reduced labor rate of $75. What if I forget to flag? Dowco will not aerate. We will contact you to reschedule the next time we are in your area which may be up to two weeks. Please water thoroughly the day before Dowco aerates. When the soil is moist, the tines are better able to penetrate and release longer plugs of soil. 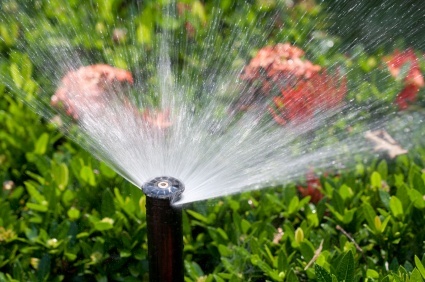 You can water as soon after aerating as you’d like. It is important to water the seeds in immediately. The ground should be damp, but not soaking wet. There should not be so much water that there is runoff. It's important to keep the soil moist at all times until the seedlings establish. DO NOT RAKE THE LEAVES! Seedlings are delicate and have shallow roots. 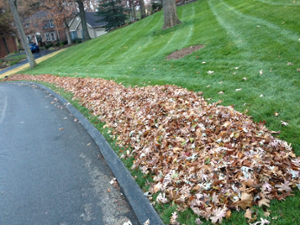 The best way to remove leaves is to blow or mulch them up with the lawn mower. Fill out your leaf questionnaire online. How soon can I mow? 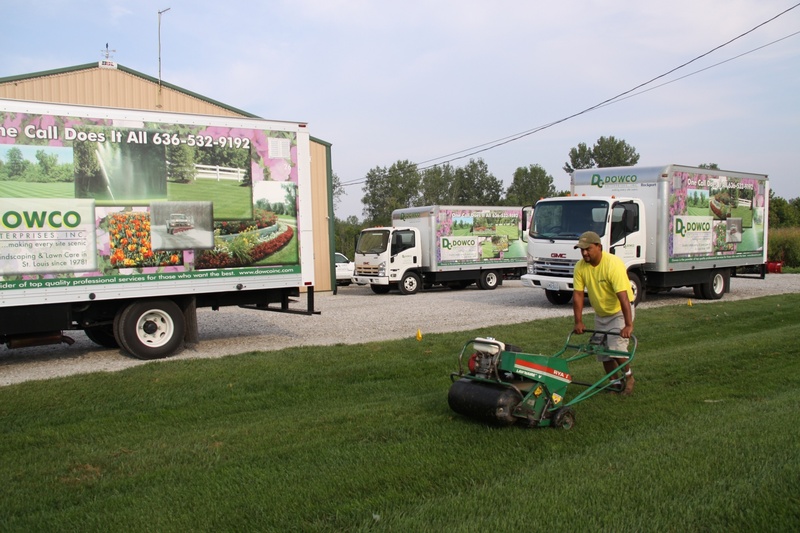 You can mow as soon after aeration as you’d like. 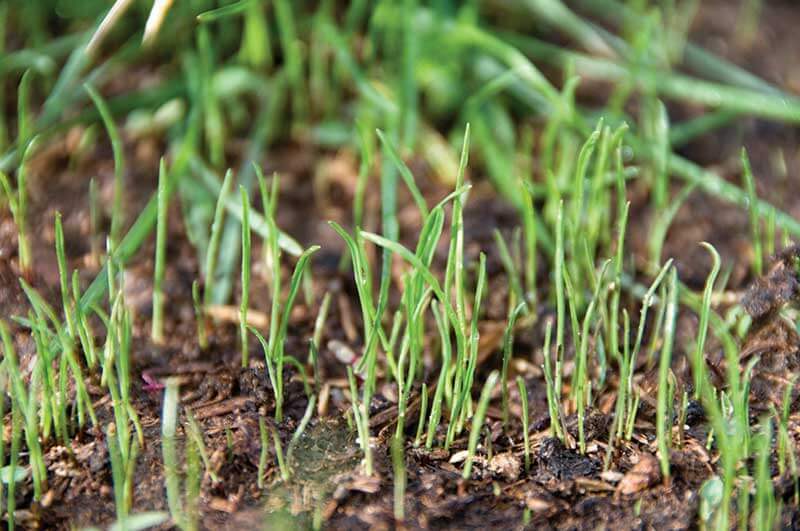 If you are over-seeding at the same time, the grass may be mowed AFTER the new seed has been watered in. It is okay to mow weekly AFTER the seed has been thoroughly watered in. What about fertilization & weed control? Dowco will fertilize the seed with a specially formulated product that encourages new seedling growth. After seeding, Dowco will not use weed control. You will see seedlings begin to germinate within 7-21 days. Early September seeding will be able to see nice germination before the end of the fall season. Late season seedings will over-winter and reach maturity next spring. Do I need to be home on the day of aeration and overseeding? What if a storm comes right after I seed? Hooray! The water is great for the seed! It will help to wash the seeds into the aeration holes. We will return within 30 days to spot seed any areas that may have experienced run off. What if I have a trouble spot? Let us know the area in advance so we can pay special attention to this area. We will return within 30 days to spot seed trouble areas. If you’re feeling extra ambitious, feel free to pick up a free bag of seed at our office at any time! We hope this information helps as you make a decision to beautify your lawn this fall. If you have any questions, please send us an email!